Finally back to our beloved WestGermany for a night of beautiful music, tape loops, field recordings, synths, drones, musical saws and more! Paul Beauchamp began his musical career at the base of the Appalachian Mountains in the early 90s experimenting with tape loops, field recordings, found objects and improvised instruments performing in the art group Diviner. After several years of activity in the home taper scene he cofounded the international artist/musician collective Radon which went on to record and publish such diverse acts as Smegma and Steve Mackay as well as his own Radon resident tribal/industrial/noise group Sikhara with whom he traveled extensively touring America, Europe and Asia non-stop for several years. During the course of these events Paul has had to opportunity to collaborate with a myriad of influential musicians in the studio, live and improvised composition including Johann Johannsson, Colin Potter, Steve Stapleton, Jochen Arbiet, Fabrizio Modonese Palumbo and Julia Kent. 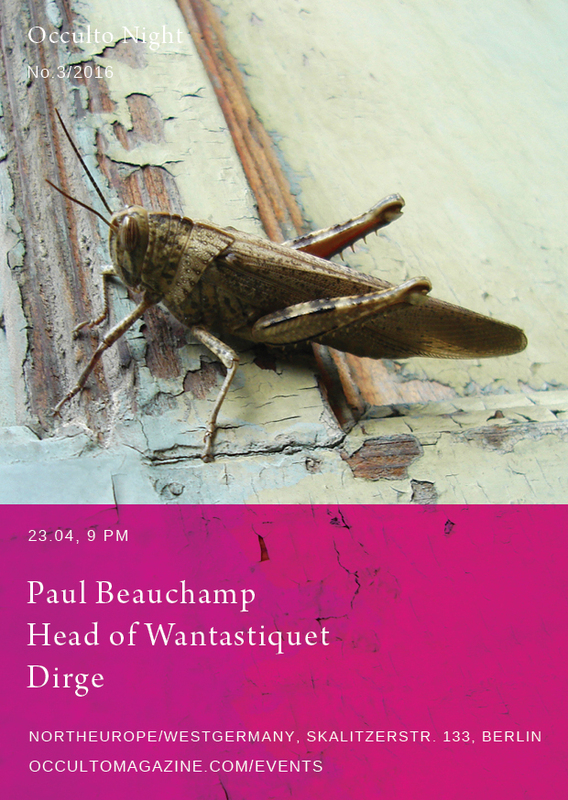 Head of Wantastiquet is the current solo project of sound artist Paul LaBrecque: The music is a thoroughly Modern/NOW take on the early minimalist experiments of John Cale’s Sun Blindness tapes, projected through a prism that refracts into hallucinatory images of Andrew Wyeth and Caspar Friedrich, the temporal finality of Altamont and Kenneth Anger, the bare feet grounded to the soil of Träd Gräs och Stenar, and the beautiful desolation of Doc Boggs’ early 20th century Appalachian hollers. Collaborations and live performances with: Sunburned Hand of the Man, Thurston Moore, Faust, LSD March, Magik Markers, MV&EE, Wooden Wand, Louise Landes Levi, Orphan Fairytale, Cam Deas, Daniel Bachman among others. Releases on labels such as Open Mouth, Ecstatic Peace!, Conspiracy, Letmo Productions, Manhand and Wooden Finger. The Occulto Nights series brings experimental live music in Berlin, with an eye on touring artists and new projects that have never or rarely performed in town. Focus on independent, underground music research. No genre fetish: We love analogue synths and we love noise but we’re not afraid of laptops, guitars, songs and beats. After the acquatic explorations depicted on the flyers of the 2015 season (in the abyss) – that featured artists such as AUN, Stefan Juster and Mai Mai Mai –, 2016 visuals will be set in a different element and dedicated to arthtropods.